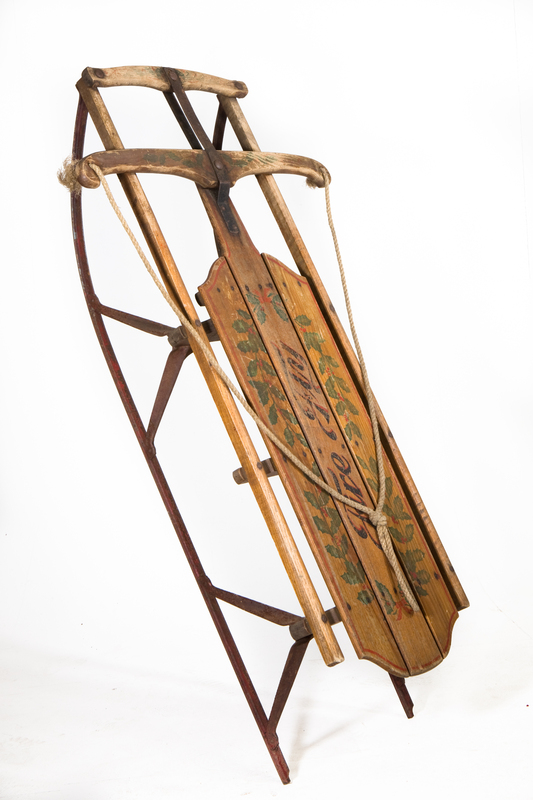 I was chuffed to bits to be assigned a beautiful antique wooden sledge. I love scouring salvage yards and charity shops for vintage bric a brac and my collection has everything from a carpet beater to a chamber pot. But my interest in items with a past isn’t because I grew up surrounded by antiques. My childhood home was modern and fashionable with the latest geometric wallpaper, macramé house plant holders and a smoked glass coffee table. This era of mass-produced merchandise meant that childhood toys were predominantly plastic; I took pride in my Sindy doll’s outfits, lusted after my best pal’s Space Hopper and spent hours clicking together two acrylic balls called Clackers. The sledge bore no resemblance to anything I’d ever played on and that’s what inspired my 62 words. I doubted that many children would remember owning a sledge as ornate and skilfully crafted. Most folk wouldn’t have memories like a scene from ‘It’s A Wonderful Life’; they would remember using a cheap substitute for a fancy sledge. The ‘voice’ of my sestude uses urban Scots to shine a mirror on a childhood winter, which more accurately reflects the experience of many rather than a few.